If you’re in the DC metro area, don’t miss this inspirational and empowering event organized by Empowering Ethiopian Women Group on Sunday, June 10th @3 – 5 pm (the program starts on time). Using the platform, I’m going to talk about how each and every woman has the potential to become one of the great world changers, how leadership is their birthright, and some of the skills necessary for women (of course, men too 🙂 to demonstrate confidence. I’ll cover some of the soft skills necessary for women to succeed in the work and marketplaces such as communication and feedback giving. For instance, how to communicate like a pro, how to ask for a raise or promotion, and how to provide feedback. In the latter case, for example, how to provide feedback (without damaging the relationship) to a co-worker or boss, especially if you feel like he is crossing certain boundaries, and more. 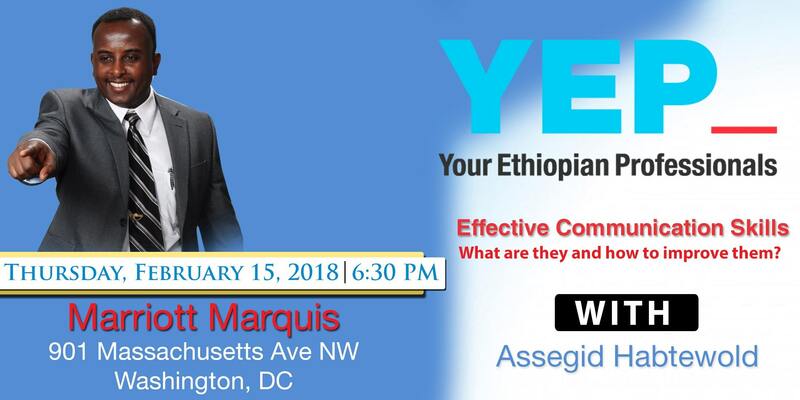 This coming Thursday, February 15, 2018, @ 6: 30 pm at Marriott Marquis Washington DC, I’m going to facilitate a 2-hour workshop on the theme: Effective Communication Skills. Here are two strong reasons why you need to attend this workshop (or recommend someone) if you’re in the DC metro area. Title: Effective Communication Skills: What are they and how to improve them? One of the most respected motivational speakers- Les Brown, said: “Effective communication is the number one tool to succeed in any endeavor.” More than we would like to admit, we all communicate at home, in the neighbor, work, and marketplaces.The question is whether our communication is effective or not; whether we are getting the results we’re looking for or not. If your desire is to communicate better and get what you want and advance in life, your profession, and attain success in whatever you are doing right now, you need to attend this workshop. In this workshop, you will learn about what are effective communication skills, what types there are and where can you apply them, and different tools you can use to improve your communication. The facilitator of this workshop is Dr. Assegid Habtewold, the author of ‘Soft Skills That Make or Break Your Success’. Effective communication is one of the soft skills that make or break your life, career, and/or business. – cross-cultural communication play in the 21st C work and marketplaces. The workshop is highly interactive packed with insights, approaches, and tools, which you could immediately apply to take your communication skill to the next height. Assegid Habtewold is an author, coach, consultant, speaker, and trainer at Success Pathways, LLC (www.successpws.com). He has written four books including ‘Soft Skills That Make or Break Your Success: 12 soft skills to master self, get along with, and lead others successfully’. He has over two decades of leadership experience and has been empowering leaders from diverse industries. He facilitates interactive workshops on soft skills and leadership themes for some government agencies, major corporations, and community organizations. Great leaders are extraordinary communicators. They don’t leave communication for a chance. They work on their speaking ability consciously. Many genuine leaders, however, mistakenly believe that as far as they have the zeal to lead, they can successfully fulfill their mission. Wrong! As a leader, you may have golden messages, clear vision, and outstanding strategies. It doesn’t matter unless you know how to communicate them with your team, partners, and alliances. Remember, almost all of the leaders in history, and many of the successful contemporary leaders around the world were/are extraordinary communicators. There are so many barriers that stand between your golden and timely messages and the people you are called to lead. Don’t forget, changing people requires communicating at multiple levels: heart, mind, and emotional levels. That is why you should learn how to bypass some barriers to communicate successfully. 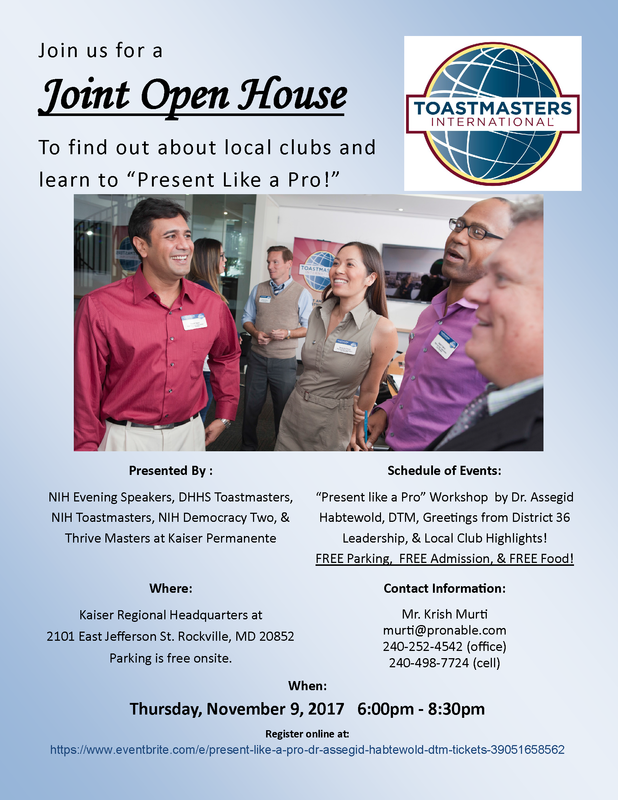 Watch this interactive workshop that I facilitated for five Toastmasters clubs in Rockville MD. I usually give a two-day or one-day seminar on presentation skills. Thus, this is the shortest version. If you would like me to facilitate this or other soft skill workshops to your group, don’t hesitate to reach out to me (Tel: 703-895-4551 or email me at assegid@successpws.com). Don’t worry; I’ll make sure to customize the workshop for your group/event. If you have a one-on-one coaching need, let me know. I joined Toastmasters (TM) in 2009. As a leader, I benefited tremendously from this outstanding organization and its leadership. If you saw me speak back then, you wouldn’t believe it’s now that the same guy 🙂 Because of TM and my mentors, I’ve come a long way. Not only I’m now speaking well, I coach supervisors and managers to have high impact communication from the stage. Practicing opportunities for a few volunteers who would like to practice and get feedback to take their presentation ability to the next level. Click this link to watch this < 3 min video clip to learn the learning objectives of a one-day workshop that I provide to my clients on the same theme. The contents of this 2- Hour workshop are taken from this workshop. 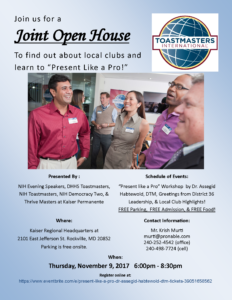 If you are available that day, and if you live and work in Rockville area, you should attend this Joint Open House organized by five Toastmasters clubs in the area. Hear from TM’s leadership, and ask questions so that you could be able to join one of the clubs where you may practice what you are going to learn that day. Don’t miss this opportunity! As a leader, you should work on your communication ability. You should fine-tune your competence to speak clearly, authentically, and credibly. For more info, check the attached flyer. Not only that, extraordinary leaders get along with diverse people successfully. They know their place in their community, team, and organization. They play their unique roles. They communicate effectively, turn conflicts into opportunities, and have high cultural intelligence. Outstanding leaders lead others successfully because they first developed personal mastery, they first led themselves successfully. They’ve got along with people from diverse backgrounds, priorities, cultures, religions, political ideologies, and so on. They are good in inspiring their people to aim high. They develop their team by giving them individual attention, by mentoring and coaching. They are skillful negotiators for win-win deals. They also know how to lead change smoothly. If you would like to join these elite group of unique leaders, you need to develop personal mastery, get along with and lead others successfully. And, the new book of Dr. Assegid Habtewold, founder of PRO Leadership, provides you the 12 top soft skills that are vital to take your life, career, and business to the next level. Go to www.successpws.com, New Book page, and download the first part of the book for free by subscribing at the middle of the page. If you like what you read in the first 40 pages of the book, well, you can go to Amazon to purchase the book only 9.99 USD. If you have young kids, siblings, relatives, colleagues, and friends, this is a gift worth giving. You’re investing in this future. Plant this seed in their life, it will give them latest insights and tools to develop their soft skills that make or break their future. If you have a business, team, and leader of your organization, well, why don’t you invite the author to come and facilitate workshops for your team based on all or some of the soft skills.